While September is usually a really nice month, this one has been like an early version of October. But I'm really happy about two things—the great turnout we had and the sun finally breaking through. The first sketch of the market is like those already posted, probably because the viewpoint offered some protection from the downpours. 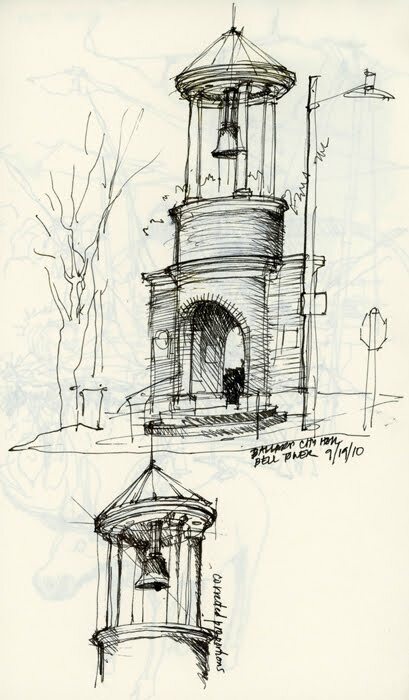 In the second image of the Ballard bell tower, I had to redraw the upper portion after I realized I didn't get the proportions right the first time. Love how you perfectly captured that end building Frank, and the little details -- especially the bike in the foreground. Yum. It is fun to see the same view point from different people. Even though we were at the same location we each sketched it a little differently. 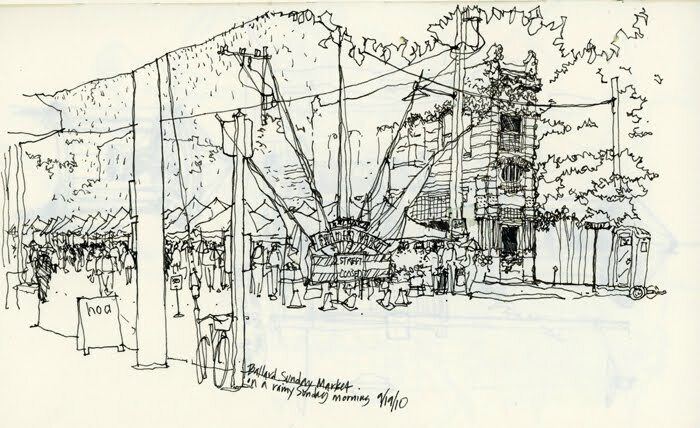 Masterful drawing of the Ballard Market - showing enough detail to get the flavor and simply framing the scene. Amazing feeling with economy of line! My belltower drawing fell off the page and nice to see you recover and get it done. I was amazed to see some great downtown sketches of highrises in the sketchbooks - getting all the power of that verticality on a small page.